Interclean is a huge international event for the global cleaning industry. 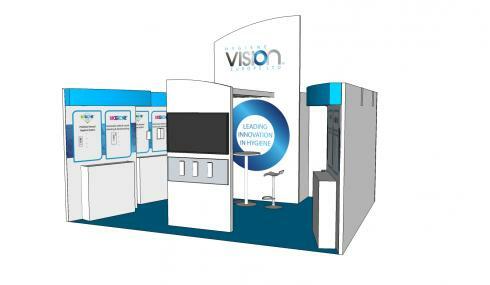 Hygiene Vision were in need of a stand that was as much inspiring as it was functional. The international manufacturer of washroom hygiene systems and products had secured a great position in the exhibition hall of the RAI in Amsterdam. Their 4 metre by 5 metre space required a custom designed stand with three walls and one open side. 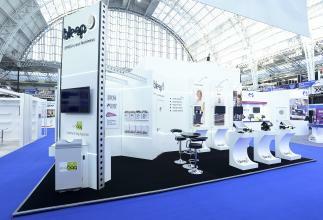 They wanted a fresh and contemporary feel to their display that mirrored their branding and company ethos. The stand needed to draw visitors in as they were passing, but also from across the exhibition hall. 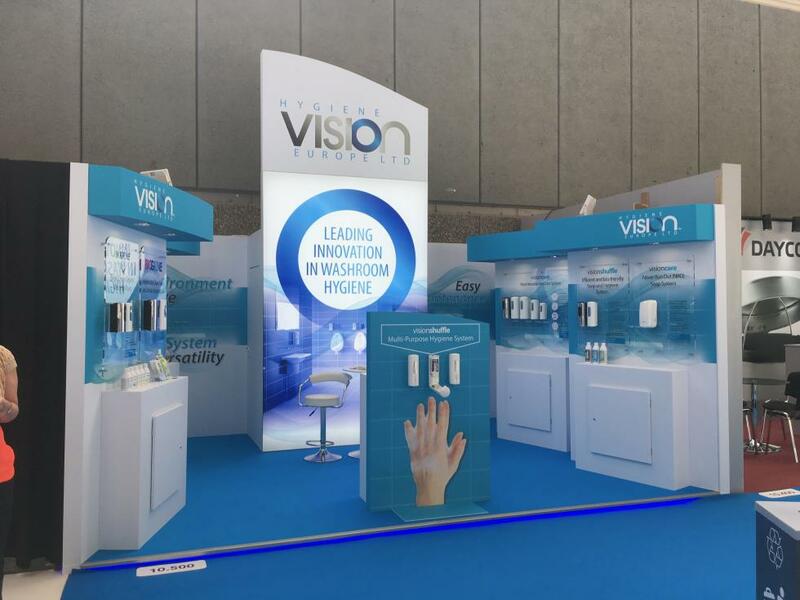 Once on the stand, the Hygiene Vision team wanted their visitors and potential customers to be able to comfortably view, feel and experience their impressive product range as well have an opportunity to sit and talk with the team. There was also a practical need for a lockable walk-in store room with shelving and room to install a fridge. The store also provided a secure place for the team to put their personal belongings during the daytime and secure any valuable products and devices overnight. The finished 4 metre by 5 metre stand had three 3 metre tall walls throughout and a central 4 metre high tower with an attractive curved design and built in backlit lightbox. Along each of the side walls were built-in product display counters, each one with a integrated storage compartment below and bespoke acrylic wall mounted product display above. The display counters were staggered along each side wall and slightly angled in towards the centre of the stand. This had the desired effect of ensuring passers-by could clearly view the product displays from the aisle and consequently improve footfall. A reception counter was discreetly positioned at the front central point of the stand, obscured by a further product display, with a graphic and working product that was positioned to encouraged visitor interaction. Once on the stand customers could sit and chat with the team in the comfortable meeting space. The 4.3 metre tower provided an elevated position for Hygiene Vision branding to ensure that visitors could spot the stand from across the exhibition hall. The backlit lightbox had the dual effect of creating a sophisticated and eye catching display as well as obscuring a highly practical and functional walk-in storage room, which was positioned behind it and accessed via a discreet lockable door. The raised floor was covered in a branded blue carpet and finished with an aluminium edging strip and blue LED lighting. The exhibition was a great success for the hardworking Hygiene Vision team. The stand was a hive of activity throughout the three day event and the design and layout worked beautifully for their visitor experience and ability to secure leads. 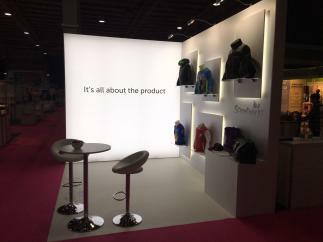 The product displays were ideal for showcasing the range and the practical under counter storage spaces and walk-in store room ensured the stand was tidy and secure throughout the event. The 4 metre tall tower did its job, creating a fantastic first impression both close-up and from afar. 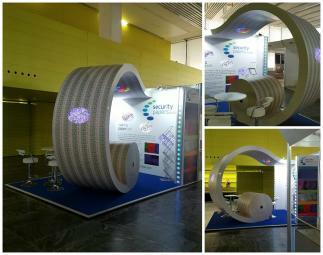 Below are some other custom exhibition stands that may be of interest. Simply click the images to read the full case studies in our portfolio. If you would like to talk through your requirements give our friendly team a call on +44 (0)1733 570222.